Microsoft Silverlight is a flash competitor; It looks good and is well worth checking out, but I’ve got my reservations if it is truely as portable as Flash (see comments on Tom Raftery’s Silverlight launch post). All the same, Silverlight is going to be big (it’s backed by Microsoft), and the IDE / Editor is setting a good standard. Not sure? Go to the Event and make your own mind up. How long could you go without Microsoft Office? I’ve recently got a new laptop (more on that in another post) and have to install the usual selection of software to get productive with it. As an experiment / not having enough time I’ve decided to go without installing Microsoft Office. I do , however have the excellent (and free) OpenOffice installed, and use Google Documents and Spreadsheets on a regular basis. It’s not about the money (as I have a copy of the Office disks paid for). It’s not about the money (2) as I’ll also happily pay for something that gives me value over the free version (e.g. my subscription to LinkedIn). It’s not really about getting locked into one supplier who can manipulate me at will (see the Microsoft Word 2007 File Format Conversion post) however annoying that may be. No, it’s more about the features; with OpenOffice, I can save Word documents as a PDF , which (in my option) looks far more professional when sending to a (prospective) client. Another reason is that as an (IT) consultant, I tend to ‘deploy’ on client sites on a regular basis, often with a bare machine to start with. Open software means that I have a ‘toolbox’ I can use to get up and running quickly , no fuss needed to raise purchase orders to buy software. If you’re interested in this approach, the Open Source Alternative site is worth checking out. It’s not dogmatic; in fact it’s pretty even handed, listing commercial and open software for pretty much everything that you might need to do with a PC or Mac (business ,communications, graphics, security etc). That’s on top of the alternatives to Word, Excel , Powerpoint and Outlook. It’s all about choice. Some are better , some or worse ; It’s up to you to decide which one works best for you. You’re a mug if you don’t know what the choice is. Update 26th August: I lasted just over two weeks without installing Microsoft Office. Nothing bad with Open Office, just Microsoft playing around with Office 2007 file format. I have an important client that sent me something in Word 2007. The sort of client that I can’t (yet) ask to save in a different format and resend. Open Office does not (yet) open Office 2007 files, so I had to drop back to the Microsoft version (and install some filters) to be able to read it. Here’s the good news – Microsoft is using a new file format for Office 2007 , which is due out shortly. It’s fairly simple – just text with tags (aka XML), zipped up to make it smaller. For example a 5Mb Word file shrinks down to 10% of it’s size in the old format. Can you send that file again, but save it as the older version of Word? Not a line that I’d want to say to important client. A friend of mine finds himself in that predicament. How do you convert Office 2007 files into ones that Word 2000 / Word 2003 can read. So far I’ve tried the following to help him out. Used Google’s online Documents and Spreadsheets. No joy – which is surprising , given that the new format is (techically) easier to read. Perhaps something to do with software patents? Tried the excellent (and free) Office clone – OpenOffice. No joy – even more surprising given that Microsoft seems to have ripped off the idea for the new format from OpenOffice in the first place. I’m now trying the ‘Microsoft Office Compatibility Pack‘ which promises to solve the problem for older versions of Word. Number 3 (the pack from Microsoft) works. Even more importantly , it allows you to save into the new format. However , not everybody is going to know / be bothered to install this large (27mb) download.For a change this important, why isn’t it installed automatically as part of windows update? I’ve only tried this for Microsoft Word, but it should be able to convert from Excel 2007 into Excel 2003 and Excel 2000 as well. I expect OpenOffice and Google docs to catch up with this fairly shortly. That is , if they can get around the legal tricks that Microsoft are playing with the new format. 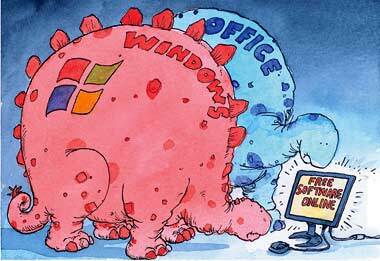 An Article in this weeks Economist shows how Microsoft’s core business is under threat from online software. This is on top of the threat from Open Software.